Specialists analyse geological structure, carry out special tests, such as seismic analysis to confirm the initial assessments of areas having hydrocarbons. Drilling is undertaken when there is high probability of discovering gas. The natural gas extracted from the deposit is filtered and purified in order to meet standard specifications. The liquefaction process reduces the volume of gas by a factor of around 600 at -163°C. The density of LNG is around 45% that of water. LNG tankers are double-hulled ships specially designed to prevent hull leaks and ruptures in the event of accident. The LNG is stored in tanks at a temperature of -163°C and at atmospheric pressure. Once received and offloaded, the LNG is returned to cryogenic storage tanks for regasification. Regasification consists of gradually warming the gas back up to a temperature of over 0°C. It is done under high pressures (60-100 bar). LNG is also de-bulked into road transport trailer. Inland transportation of LNG is through Cryogenic road tankers. Cryogenic LNG Tanks are mounted on Double-Axle and Triple-Axle Trailers to distribute to customers. Using suitable Prime-Movers it is transported to the required locations. 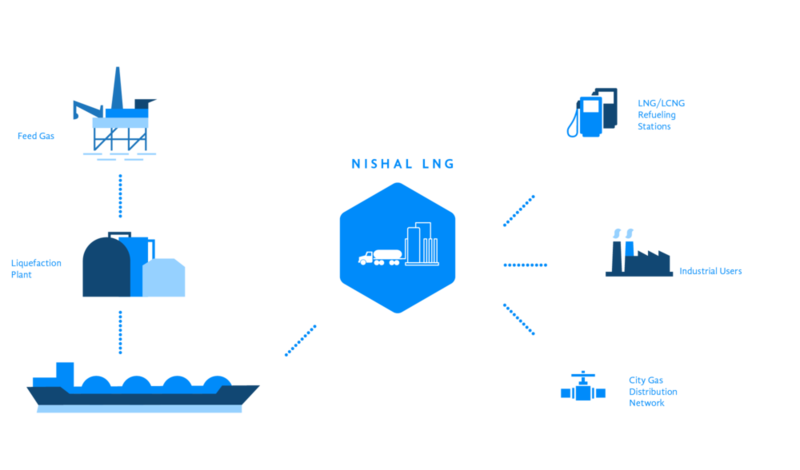 Customers who are not connected to natural gas grid can use LNG satellite station for their requirement of natural gas. LNG is stored in a storage tank and continuously filled by the inland bulk trailer. This LNG is converted into natural gas by ambient air vapourizers. We source LNG from Liquefaction Plants as well as LNG Terminals. We establish and manage the LNG supply chain through dedicated tankers. We provide LNG Satellite stations with regasification facility on OPEX basis.